There are a large range of pruners to choose from on the shelves at Aylett Nurseries. But what do you look for in the ideal secateurs? We believe one of the best to be the Felco secateurs. Apart from being self propelled there is not much you can improve upon in them – but you do of course get what you pay for! When selecting the perfect secateurs, strength is a hugely important feature. When cutting, if the blade spreads apart from the anvil part of the tool as it tries to cut thick wood, the pruners will not make a clean cut. This would leave “snares” on your plants, particularly when working on soft wood, for evermore. Felcos are tough enough to resist this spreading where other brands fall short. Felco handles are made from an alloy giving lightness and strength, while the blade is made of steel, ensuring it stays sharp for long periods. Along the reverse of the anvil is a sap groove which ensures dirt does not dry and clog the pivot. On this pivot is an adjuster so that after long periods of use, should there be any signs of wear you can tighten up a nut and so bring the tool back up to standard. An easy to use catch is not always a standard feature. 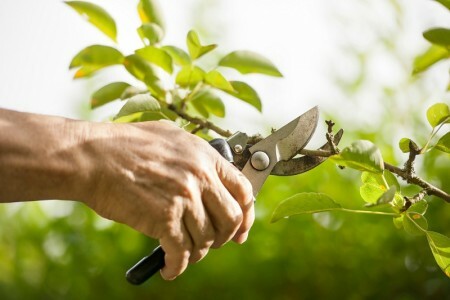 With some secateurs you have to squeeze very tightly to operate them, this is of little use to those who have weak wrists! Always try out the tool before you buy. Our Felco range has a display stand, or please do ask us and we can show you various models to try. Some manufacturers offer a repair and spare part service. Felco is renowned in this department. All parts are replaceable and the work can be done for you if you prefer. Any pair of secateurs will perform better if they are cleaned after use. Wipe off excess sap and apply a light coating of oil to the blade. Some tools have a “worm spring” to open the handles after each cut. If left to clog with dry sap, the spring sticks and falls out, so attention to cleaning here is always worthwhile. Felco is a swiss brand and renowned for its quality. They even make their own machinery to produce their tools. Sometimes the pocket won’t stretch that far, but if you fancy treating yourself one day please pop in for a browse, alternatively they make a fabulous gift for a new or experienced gardener. With Mothers Day around the corner, perhaps an upgraded and quality set of sacateurs would be the perfect gift? Previous Post: Half Term ‘Finger Knitting Challenge’ – How far did we go? Next Post: Our top 5 beautiful bulbs to plant now for some summer colour!